Leaving the Displaced Persons Camp for the USA. 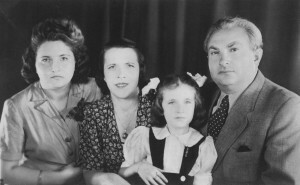 Pictured from Left to Right: Ruth’s Mother Celina, Sister Lucia, Little Ruth and Father Peter. Ruth Millman was born on July 16, 1938 to Peter and Celina Iberkleijd in Warsaw, Poland. Ruth resided in Warsaw with her parents and elder sister of ten years, Lucia and grew up surrounded by her extended family of 80 people; the family was very close. Peter Iberkleijd owned three textile mills in Poland and his family enjoyed a life of luxury. Ruth’s life changed when Hitler and his army invaded Warsaw, Poland in the fall of 1939. The Iberkleijd family watched in horror as the Nazi troops took over their homeland. After seeing his extended family forced to go to the ghetto, Peter Iberkleijd took his wife and two daughters and went into hiding in the attic of one of his textile mills. Two weeks later, they were discovered and sent to the Warsaw Ghetto in 1941. Ruth and her family were forced to live in and share a small apartment with another family in the ghetto. Ruth was three years old at the time. Ruth grew accustomed to a life without school, with little food and with an environment filled with dead bodies. For Ruth, it was normal to see innocent people being badly beaten or murdered by the Nazis. Ruth’s grandparents were told that they were going to be taken to a place with larger apartments that would provide them with greater comfort. Ruth later found out that her grandparents were among the first people to be murdered at Auschwitz. Peter and Celina Iberkleijd were ingenious. They had hidden emeralds, diamonds, and gold on their bodies in the ghetto. Peter Iberkleijd knew that if his family remained in the ghetto they would not survive. He was innovative and used the jewels to bribe Nazi officers in the ghetto to allow his family to escape in 1942. Peter Iberkleijd was dark skinned and had dark eyes and hair. He did not have the characteristics of Hitler’s Aryan race. Peter, therefore, hid in the four-foot basement of a Christian home. Ruth’s sister, Lucia was sent to a convent. Ruth and her mother Celina were fair skinned and had blue eyes. It was arranged that a Christian man would be paid to marry Celina for 3-4 months. The marriage would appear to be legitimate in the state of Poland. Ruth went with her mother and Ruth’s name was changed to Theresa. Ruth attended church every day and was told that she was not Jewish. After the 3-4 months, Ruth and her mother were on their own. They lived off of the streets of Poland stealing food from food carts and resting their heads wherever they could find space. It was not long before the two were caught by the Nazis and sent to the Lintz Labor Camp in 1943. At the camp, Ruth’s mother worked eighteen hours a day making ammunition for the Germans. Ruth and her mother had bread and water for breakfast, soup for lunch and bread and water again for dinner. Ruth soon became very ill. Ruth’s mother went to a Nazi officer and pleaded for medication to relieve her child. The officer refused. This refusal did not stop Ruth’s mother. During a bombardment at the camp, Ruth’s mother and four other women stole sheets and blankets. They wrapped Ruth in the blankets. Celina and the four women then ran the bundled Ruth out of a hole in the fence of the labor camp. Celina and Ruth jumped on a nearby train without knowing its intended destination. On the train, they met a priest who gave them food. The train stopped in Riccione, Italy, a fascist country at the time. Celina spoke five different languages including Russian and pretended to be the wife of a man in the Russian Army to the people of the town. Ruth and her mother then migrated to the mountains where they lived with fifty or sixty people in 1944. There was a great sense of camaraderie in the mountains. Ruth and her mother felt safe for the first time. The two stayed in the mountains until the end of the war. The Americans invaded Riccione and threw Hershey bars, nylon stockings and cans of peaches into the air while shouting that the war was over. Ruth and her mother went to The American Red Cross that was stationed in Poland. The Red Cross maintained a list of the deceased. (Andie not born yet), Jennine and Paul. Standing left to right Sophie, Todd and Dan. They learned that Celina’s siblings and parents had been murdered, but that Peter and Lucia Iberkleijd were alive and in Lodge at the conclusion of the war. The Red Cross took Ruth and her mother to them. 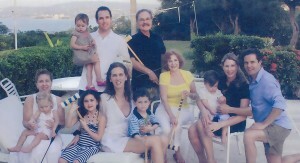 The Iberkleijd family had a wonderful reunion and were grateful to all be alive. Peter Iberkleijd did not want his family to stay in Poland and applied for a Visa. His application was denied. The Iron Curtain had fallen, but that did not stop Peter. He hired an ambulance to hide his family (not inside but underneath the ambulance) as they moved across boundaries from Poland to East Germany and finally to West Germany. In West Germany, the family stayed at a Displaced Persons Camp. Peter had a friend who lived on Broadway in New York. Peter wrote to him and received a reply of aid. The Iberkleijds soon set out for their 14-day journey at sea to New York. There, Peter’s friend greeted the family and soon after helped them to find a home.